Sheriff's Deputy Reed Edelman was in pursuit of 34-year-old Steven Benefield, who had reportedly confronted his estranged wife at her home and then fled on a motorcycle. Image courtesy of Grimes County Sheriff's Office / Facebook. 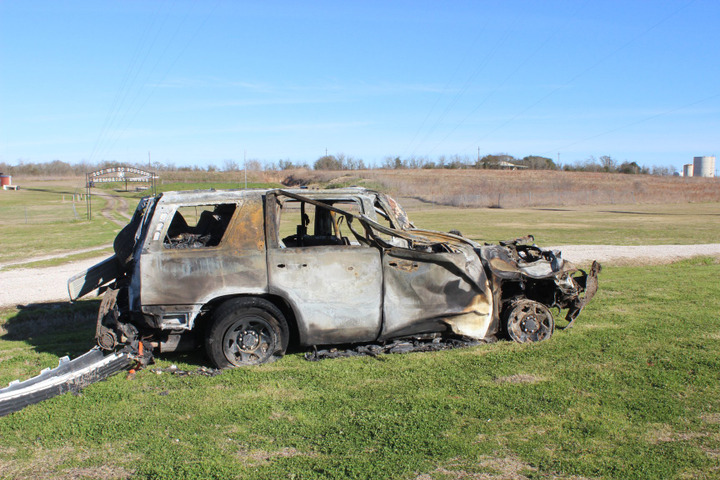 A deputy with the Grimes County (TX) Sheriff's Office was injured after a high-speed vehicle pursuit ended in a fiery wreck. According to KAGS-TV, Sheriff's Deputy Reed Edelman was in pursuit of 34-year-old Steven Benefield, who had reportedly confronted his estranged wife at her home and then fled on a motorcycle. During the pursuit, rain began to fall, but Benefield continued on, reaching speeds of 130 miles per hour, the agency said on Facebook. Deputy Edelman's patrol vehicle reportedly hydroplaned and left the road, flipped several times, stuck a tree, and caught fire. Edelman climbed out of the vehicle to safety, according to the Grimes County Sheriff's Office. Edelman sustained several injuries, including fractured vertebrae. He was transported to a nearby hospital where he was treated and released. The motorcycle was located approximately one mile north of the accident scene by DPS Troopers and Benefield was taken into custody. He has been charged with evading arrest with a vehicle causing serious bodily injury.